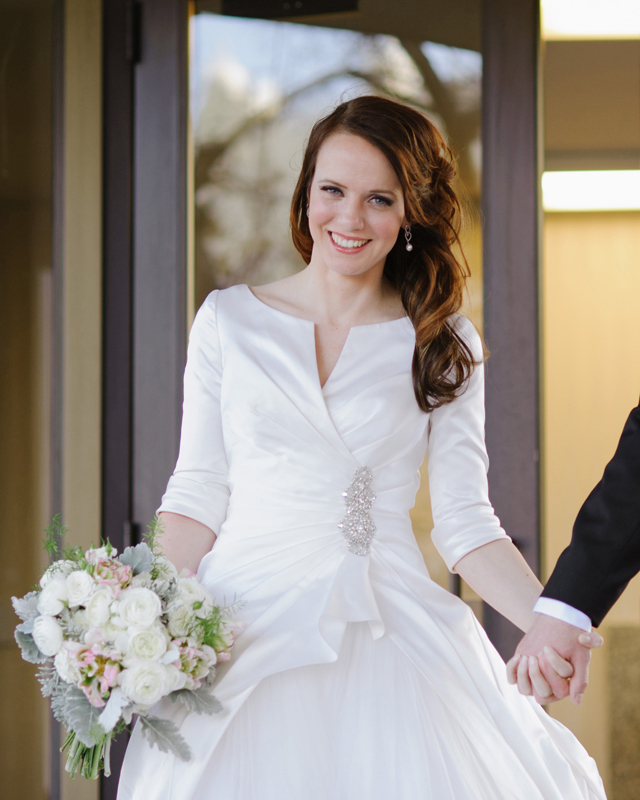 I’m excited to finally share photos of one of my latest Couture Brides, Jenn! She was a dream to work with and I’ve had fun sifting through all of her wedding photos by Heather Nan Photography to find these, my favorites of her and the gown I made for her. After Jenn’s initial design consultation the three absolute-must-haves for her dress were that it had to have sleeves, she wanted it to show her collarbones because that’s her favorite feature, and she really liked tulle. With those criteria in mind I thought about it for the next few days. After drawing the first sketch I knew she was going to pick it, so I held off on doing any more drawings until I could prove my hunch. This was indeed her dress! When she saw it she loved it and that was that! At the time of her design consultation, the wedding was going to take place in Newport Beach in March, so I did the original sketch with very slight cap sleeves and gave her the option of doing a longer 3/4 length sleeve depending on how the dress evolved; I would drape it both ways to decide what looked best on her when we fit the muslin. But before I got to making the muslin the location of the wedding was changed to Salt Lake City (same time of year), so we decided to go ahead with the longer sleeve since it would look and feel more appropriate in the colder climate. That’s one of the great things about doing a custom gown; it can evolve and change to perfectly suit many different criteria. The gown is actually two separate pieces: a tulle and organza skirt, and the gown, which is more like a jacket with a train (in double face duchess satin—the same fabric I used to make my sister’s wedding gown). Jenn was planning to wear the gown as pictured for the whole wedding and reception, so I constructed it accordingly, but for a bride that just wanted to have shoulders and arms covered for the wedding ceremony I could have easily made the skirt underneath into a gown of its own with a strapless bodice or corset. Again, that’s the beauty of doing a custom gown—making it unique to the bride who will be wearing it. Congratulations to Jenn and her husband! They are a lovely couple, and, as always, I enjoyed getting to know them and having such a special role to play for their big day! Next Gingerbread Cookie Collaboration 2013! This gown is just perfect, truly a piece of art. Jenn is a dear friend of mine and the dress captured her style perfectly! Classic, and yet not boring. Sophisticated with a little bling. Absolutely love it!